For the latest news on my brand-new creative writing masterclasses for adults, starting in March 2019 please see here. I love going into schools and talking to kids about my work and my passion for books and reading. I also teach occasional writing workshops for adults (see above). 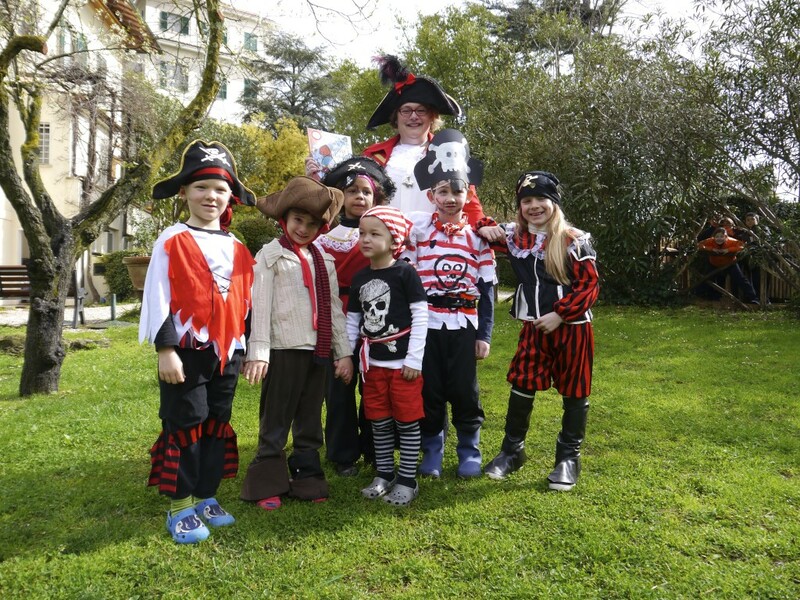 Here are just a few of the nice things schools have said about my recent visits (and a great photo of me and some pirate kids at The New School in Rome). I do a MAXIMUM of three events per day, and my fees, terms and conditions are set out at the bottom of the page. Group sizes are always negotiable, but normally 70 kids is the limit unless indicated. All the events I offer in schools are listed below, as well as equipment requirements. If you’d like to ask me about a visit, you can do so through the Contact Page, but PLEASE do remember I get booked up well in advance for World Book Day and Children’s Book Week, so don’t leave it till the last minute! Who’s the hero? Why I made Horrible Heracles the baddie. Fantastic Cleopatra – sultry siren or feminist icon? Is writer’s block real? How do you tackle getting stuck? Learn to Talk like a Pirate- lots of Yo Ho Ho and singing but NO rum! For all sessions I will need working PowerPoint facilities (screen and technology to plug a USB stick into), a lectern for notes (can be a music stand! ), desk or table and chair or stool, please, plus water and a glass. For the Picture Book Fun and Beastly Olympus interactive drawing sessions, every child will need paper and crayons or felt tips, and I will need an A3 flipchart or board with marker pens. Please arrange for a local bookshop to be available to sell my books at the event. I will be delighted to sign copies either during the lunch break or at the beginning/end of the event. Nobody likes discussing the nitty gritty bits like money, but it has to be done! Please do read The Society of Authors ‘Author Fees Advice for School and Library Visits’ for guidance and more information on why I and other authors charge what we do for visits. All school visits are charged at £500 per visit plus travel costs and expenses. If overnight accommodation plus meals are necessary this will be added to expenses. Visits over 5 1/2 hours travel (round trip) will require an overnight stay. NB: Sometimes two or more schools in the same area get together and share the travel and accommodation costs. Please consider this. As well as visiting schools, I’m always happy to visit libraries, literature festivals and bookshops and also happy to travel abroad to international schools if enough notice is given. Library visits will be charged at a rate based on my standard fees (see above), but taking into account the length of the visit. I am passionate about the importance of libraries, so I do try to keep costs down as much as possible. Bookshop visits for promotional purposes around publication are normally free of charge, and include a reading or two and a signing session. Bookshops requiring a day of events and/or a school visit as part of an event should expect to be charged at my full rates. Literature Festivals usually offer a reasonable fee as standard, I have found. Please contact me or any of my publishers directly to discuss an event. Cancellation Policy: I will charge 25% of my fee for cancellation within three weeks, 50% for cancellation within one week, and 75% for cancellation 48 hrs or less before the visit is scheduled, plus the full amount of any expenses occurred prior to any visit. Late payment: interest at the current rate will be charged on all late payments over the statutory 28 days after presentation of my invoice. You can also find their full addresses on the Contact Page.